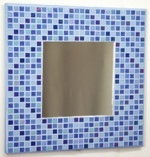 It is made from 480 tiles in 5 colours, with a nominal size of 29cm wide x 29cm high (approx 11 x 11 inches) and a 15cm x 15cm mirror. 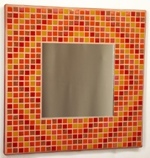 This photo shows the Autumn Diamonds 29cm Mosaic Mirror, in the Satin Edged format for wall hanging. 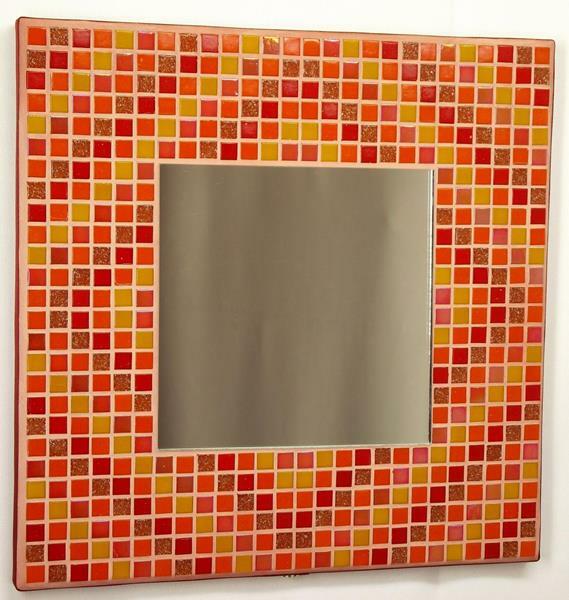 This photo of the Autumn Diamonds 29cm Mosaic Mirror shows some of the Iridescent tiles coming to life with coloured shine. 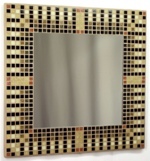 This photo shows the Autumn Diamonds 29cm Mosaic Mirror, in the Satin Edged format complete with Stand. 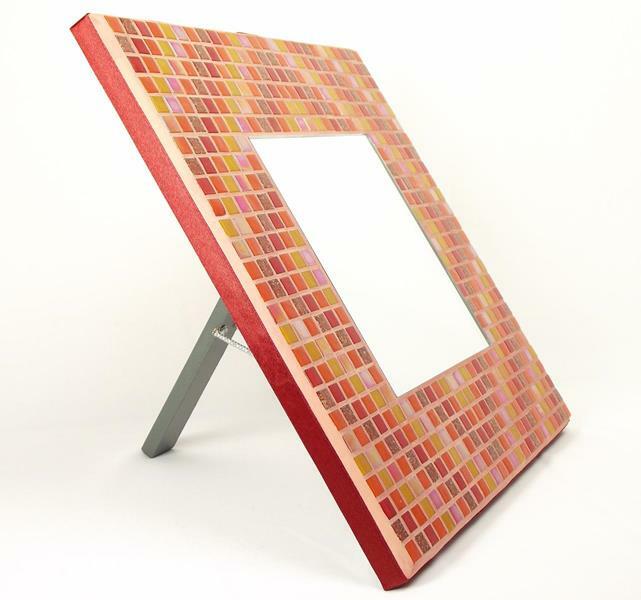 An autumn leaf mix of red, brown, orange and yellow, including an iridescent red, with a dusky red grout. Satin Edge colour: Deep Red. 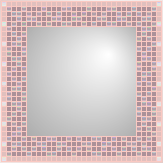 A simple geometrical pattern of graduated diagonals, forming introspective diamonds. 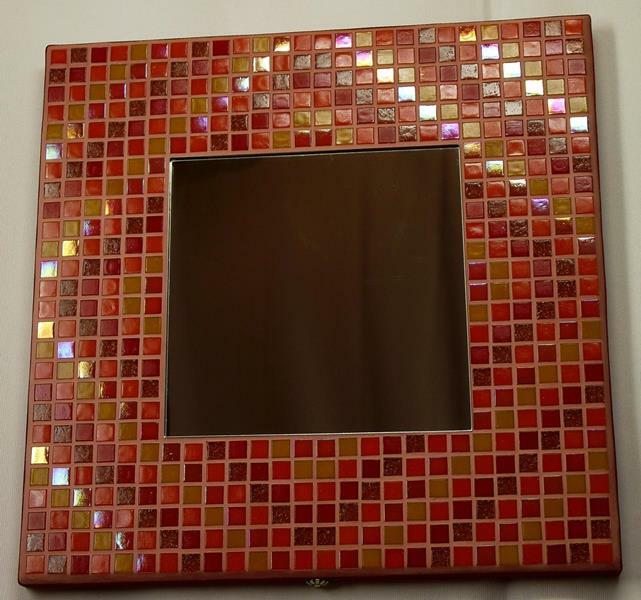 This mosaic design is Copyright © 2013 Kaamar Ltd.
Grout Colour: Dusky Red 100VW. Overall Size: 293mm x 293mm x 22mm approx. Overall Size: 293mm x 293mm x 28mm approx (with stand closed). Standing Size: 29cm wide x 26cm high x 24cm deep approx.